In 2008, Seth Godin made this bold statement, and in the decade that followed, in both the corporate world and public sector market, we have watched this statement unfold with an explosion of white papers, infographics, podcasts, sponsored articles, and videos. However, with so much content in the market, it’s hard to break through the noise. What marketers need now, more than ever, is content refinement and an understanding of WHAT the target audience wants, WHERE they are searching for it and HOW much time they want to spend with it. Looking ahead to the release of the findings from Market Connections’ 2019 Content Marketing Review survey of the public sector marketplace in May, we decided to look at what other researchers focused on commercial B2B and B2C markets are reporting. 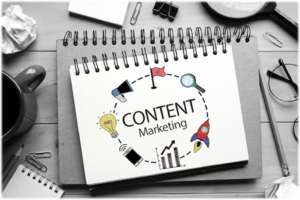 According to Content Marketing Institute in 2019, nearly two-thirds of marketers reported increased use of video and/or written digital content compared to the previous year. More than a third (37%) said they increased their use of podcasts and audio books. The amount of time you are asking your audience to invest. According to HBR, buyers’ average viewing time is just under three minutes and within that time can make quick judgments including whether to move to the next step. When to optimize content for mobile and when not to. Mobile content is leveraged most at the top of the sales funnel. But just as the type of content should evolve throughout the sales process, so should your content format. When a lead becomes a strong opportunity, the use of desktop to view content becomes more prevalent. All of these suggestions provide great food for thought for those working in the public sector market, and lead to the ultimate question: do these strategies work for the B2G market? To answer this question, we invite you to join us for a breakfast briefing: Content Marketing Review: Federal & Beyond on May 9. We’ll share how public sector decision-makers at the federal, state and local levels are responding to content: what types of content they prefer, how much time they want to spend with it, what they want to get out of it, and where they go to get it. After the results briefing, a panel of expert marketers will share best practices from their own experiences. Market Connections tries to stay abreast of news and topics that can help our clients and make us better partners. We recently came across the 2018 results of The CMO Survey®, sponsored by the American Marketing Association, Deloitte and Duke University’s Fuqua School of Business. This biennial study gathers opinions from top marketers at US B2B and B2C for-profit companies with the goal of predicting the future of markets, tracking marketing excellence and improving the value of marketing. Among a myriad of interesting findings, one in particular caught our attention: digital marketing expenditures are expected to increase by more than 12% over the next year, increasing the proportion of marketing budgets allocated to digital by almost 25% in the next five years. As always, we like to see how overall marketing trends align with those in the B2G community. Many times, overall marketing or corporate trends can be leading indicators of where the government marketplace is going. However, this time government contractors aren’t following the lead of corporate America, but rather, they are in lock-step with their commercial counterparts. Recent findings focused on the federal market from our 2018 Government Contractor Study (in partnership with Professional Services Council and Merritt Group) showed that among 200 government contractors, over half (52 percent) said digital marketing was part of their overall marketing budget and 53 percent said that they increased their digital marketing spend in 2018. What does this show? Overall, marketers (whether B2B, B2C or B2G) are seeing the value of digital marketing. Yet, with what will likely be a glut of companies focusing on advertising in the digital space, where should you focus your marketing dollars? Where can you go for more information to make smart, strategic decisions to maximize ROI? For those focused on the federal market, Market Connections’ Federal Media & Marketing Study can help focus their efforts. In our 10th year, this study of the federal media marketplace provides a comprehensive review of the media and buying habits of federal decision-makers across the country. It details more than 20 different job functions and maps them to individual media usage spanning print, broadcast, social, mobile and digital. Whether you are focusing your efforts with overall civilian agencies or specifically trying to reach IT decision-makers for Department of Defense, the tool can help you make better decisions on where to place advertising based on their habits. Which publications are they reading most? What social media are they using more often? For those “Inside the Beltway,” which radio stations are they listening to or tv programs are they watching? Market Connections will be unveiling results from the 2018 study on November 8, 2018 at the Valo Park Conference Center in McLean, Virginia. To register, visit www.marketconnectionsinc.com/fmms2018event/. The CMO Survey® collects and disseminates the opinions of top marketers to predict the future of markets, track market excellence, and improve the value of marketing to companies and to society since 2008.